Author’s Note: If you’d like more help transcribing your German documents, join our Premium group today – you get weekly access to live “office hours” where you can ask Katherine your tricky transcription and translation questions – and get immediate answers. You’ve climbed up your family tree. You’ve located your German ancestor in Germany. And you’ve finally gotten your hands on those German records. Excited, you go to work with them….only to realize they are written in old German script*, a script even most native German-speakers cannot read today. What to do? Well, if you don’t want to deal with the translation yourself, you can always contact a professional (I’d be happy to be of service). But some of you may want to give it a go on your own first. And for that reason, I’ve compiled a list of five of my favorite transcription hacks that I use myself when translating. Read below to find out more! *For more tips and information on transcribing German handwriting, see Ten Tips for Deciphering Old German Handwriting. Changing your “Spelling and Grammar Check Language” to German in Microsoft Word can be very helpful when transcribing German genealogy documents, especially if you don’t know German yourself – after all, the grammar check will actually tell you if your words are real German words or not! 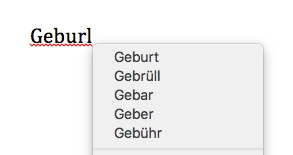 For example, if you type in the letters you think you recognize from a word in your document, Microsoft Word will underline it in red if it does not exist in German. You can then right-click on the word to see suggestions of what the word could be. Type these into a dictionary, and see if any make sense within your genealogy document. In the example below, perhaps the handwritten word looks like “G-e-b-u-r-l” to your eyes. You then type this into Microsoft Word, and see that it is underlined in red – meaning that it is likely not a German word. You then right-click on the word, and see five possibilities of what this word could be. You realize that it must be the first word on the list – “Geburt”, which means “birth.” Satisfied, you continue transcribing! Word of Warning: Our ancestors and other scribes often misspelled many words in their documents. Just because you have a red line under a word does not mean you transcribed it incorrectly. 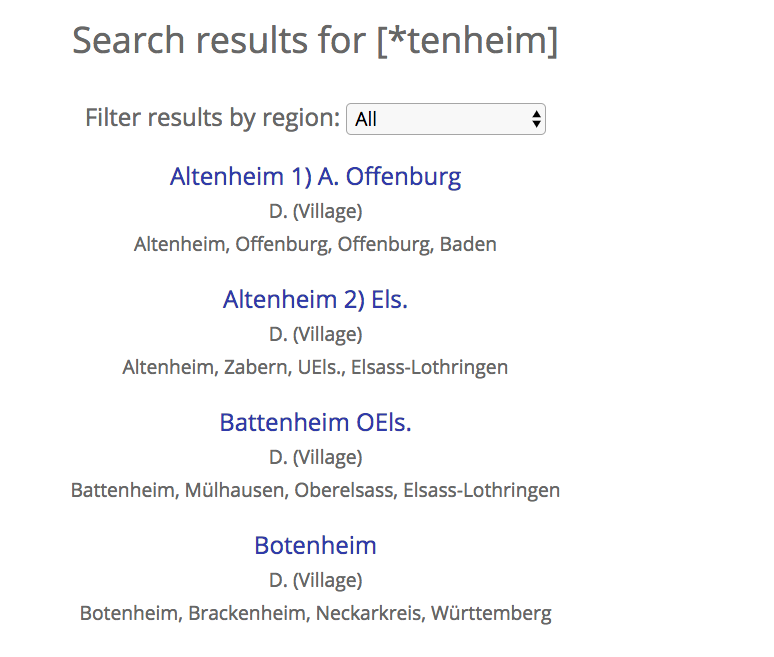 However, the “right-click list” can provide you with options for what the word could actually be (For common spelling mistakes our German ancestors made, see Think Like a German: Spelling Variations in Genealogy Documents). It is also important to note that many words that were common hundreds of years ago are no longer common today, and Microsoft Word may mark these as incorrect as well. Woerterbuchnetz.de is a great dictionary for old-fashioned German words. 2. Let Google Search do the work for you. Google’s search engine can make your transcription work much easier! Simply type your transcription guess into Google and see what happens. If many search results appear, this means you are very likely correct in your transcription (of course, it’s important to read the results to make sure that they correspond with your document’s meaning). However, if you have one or more letters wrong, Google may actually suggest the correct word for you. In a recent document I translated with rather difficult handwriting, I was relatively positive that the handwritten word looked like “Mariengemeinde S-e-h-l-o-s-kirche” (Marien Parish Sehlos Church). However, since I knew “Sehlos” did not make any sense, I typed the phrase into Google to see what would come up. Sure enough, Google suggested “Mariengemeinde Schlosskirche” (The Castle Church of Marien Parish) which made much more sense and actually existed in that area. Thanks Google! Wordmine.info is my favorite website for transcribing. Once you have identified as many letters at the beginning or the end of a word as you can, write them out, leaving a blank for the letter(s) you don’t know. Then go to Wordmine.info, and choose either or “Words beginning with” (Wörter beginnend mit) or“Words ending with” (Wörter mit Endung) and type in the first or last letters of the word you are deciphering. Press “Suche” (Search) and a list of German words with that beginning or ending will appear. Hundreds of results? Check the box “Anzahl der Buchstaben” (Number of Letters) and fill in the number of letters that you think are in the word (I always do one more and one less than I actually think, just to be on the safe side – you never know with handwriting!). Check the words against your handwritten word, and hopefully you find a match! Above, I recognized the first letters as “Scheu”, but the final two were just a scribble. I typed these letters into WordMine, along with the approximate number of letters, and then realized that my word must be “Scheune”, or “barn”, based on the word and context of the letter. 4. For town names, use Meyers Gazetteer. The Meyers Gazetteer website is a wonderful collection of pre-World War I German cities, towns, villages and more (so yes, for all of you with ancestors in present-day Poland, France or other areas that used to be part of Germany, your ancestor’s town is likely included!). If you know from the context of the document that a word is likely a town name, but can’t recognize all the letters, type the first few or the last few into Meyers Gazetteer’s search engine, using a * for the letters you can’t read. The website then provides a list of possible places with that letter combination – check their locations and spellings, and see if it matches your word and region. Hopefully you find a match! Here, the beginning of a list of German locations ending in “tenheim”. 5. Skip the word you can’t read and continue transcribing. This may sound simple, but it has helped me many times when transcribing documents. If I have spent a few minutes on a word and just cannot figure it out, I simply skip it, marking it with “—” in my document to come back to later. I then continue transcribing, and, more often than not, the word becomes clear in a few minutes – either from the context of the rest of the paragraph, or, if I am lucky, from another occurrence of the same word later in the document. Oftentimes seeing the same word twice or even three times will provide clarity to letters that looked unclear before. So there you have it! 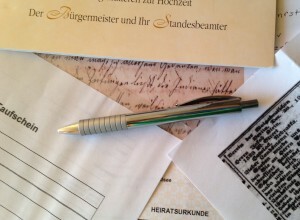 I hope these tips and hacks will help you in transcribing your genealogical documents. And if you would like a professional’s help, please don’t hesitate to contact me here. Happy transcribing!